How many movies about Hercules does it take for us to see the character truly brought to life in a good story? Apparently more than two. In January of this year, “The Legend of Hercules” brought us the hero in the form of “Twilight” actor Kellan Lutz. Strangely enough the film was received with thunderous boos as it earned a Rotten Tomatoes score of 3% (yes, out of 100). The second, and hopefully last of 2014, film about the super-powered demigod is the self-titled “Hercules” starring Dwayne “The Rock” Johnson. With Brett Ratner at the helm, this outing seemed eager to entertain while never taking itself too seriously. After enduring the trials that make him a legendary figure, Hercules becomes the leader of a small group of mercenaries who rid kingdoms of unwanted visitors or sway a conflict in favor of the highest bidder. Among his crew are Amphiaraus (Ian McShane), Autolycus (Rufus Sewell) and others. When Lord Cotys (John Hurt) hires the warriors to train his army and rid the land of an evil warlord, the group sees it as a chance for one big payday before heading off into retirement. As this scenario naturally goes in Hollywood, the plan doesn’t go as smoothly as they hoped. Playing the title hero with the absurd charm of someone in a chewing gum commercial, Dwayne Johnson is clearly trying to have fun with a role that is tailor made for him. For a character known for his athleticism and strength, the majority of Johnson’s action scenes are simply him trying to push an object over or nonchalantly swatting at bad guys like one might wave off a fly at a 4th of July picnic. I feel pretty confident in saying that 71-year-old Ian McShane has more interesting stunt choreography in the film. Though Johnson tries to make him endearing, Hercules is one of the most boring characters in a film filled with boring characters. The only three characters worth noting are Amphiaraus, Autolycus and Tydeus (Aksel Hennie). Autolycus is a mercenary of the more cold-blooded variety and Sewell gives him the funny, cynical personality that many of his characters have shared. This is my first exposure to Aksel Hennie, but the Norwegian actor made a character that has almost no audible dialogue interesting solely through body language. The film is clearly intended for an audience in the 12-18 age range as it glosses over the majority of its violence and waters down any heavy themes that would have made it interesting. One of the writers has actually made a living writing for direct-to-video sequels for the majority of the animated Disney franchises (not that there’s anything wrong with that). The script for “Hercules” is also a mess as it changes character motivations on a dime, has several unanswered holes in the story, and includes too many convenient coincidences to hold water. 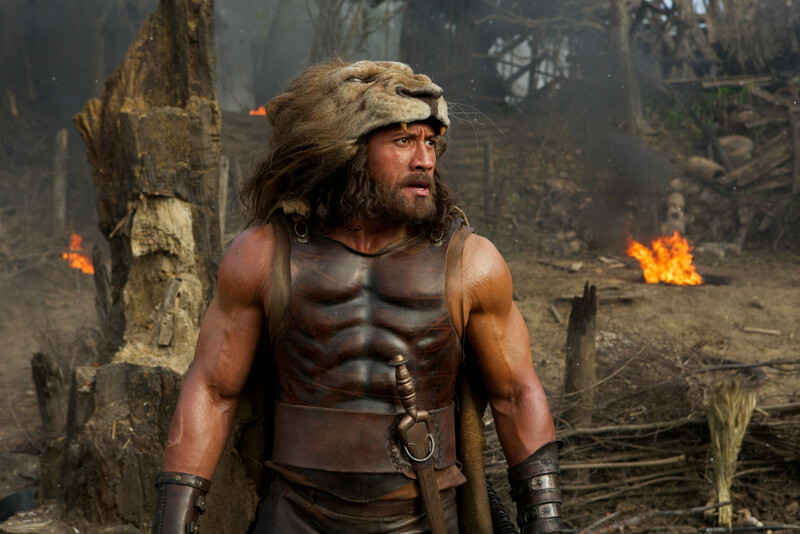 Brett Ratner and company tried to deliver a fun blockbuster loosely based on the mythology of Hercules, however, what we have instead is a pretty shoddy film that is only mildly entertaining. It may be good enough to keep your attention for 98 minutes, but anyone seeking a quality film to hold them over until “Guardians of the Galaxy” will probably wish they had just held onto their money. Would the world be better if there was a holiday each year where all crime was legal for 12 hours? This is one of the many questions asked by writer/director James DeMonaco in “The Purge: Anarchy”, the follow-up to last year’s “The Purge.” In these films set in the near-future, a new American political party has taken over and come up with the perfect way to clean up the country. Each year, the Purge holiday allows for all Americans to get away with whatever crime they wish. The streets essentially turn into the Old West as citizens “release the beast” during a 12-hour period. The program is declared successful as poverty has dropped and crime decreased, but what’s really happening is that the rich can afford security measures to last the night while the inhabitants of slums and ghettos wipe each other out. The first film in the series explored the morality of the situation on a small scale. A family is forced to choose between handing over someone being hunted by purgers, basically killing the man, or themselves being attacked by his hunters. “The Purge: Anarchy” delivers the bigger story that most people wanted from the first film. Trapped on the city streets during the Purge, five individuals have to stick together to survive the night as they are chased by murderous gangs and madmen. In one of his biggest action roles to date, Frank Grillo (“Warrior”, “Captain America: The Winter Soldier”) stars as a man only known as Sergeant. Of the main cast, he is the only one on the streets during the Purge by choice. 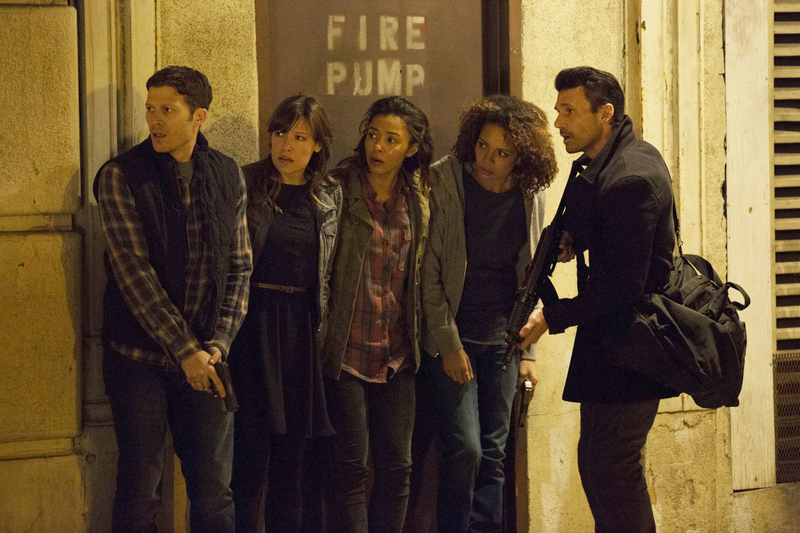 While hunting for the man who killed his son, he comes across 2 sets of people that are in need of rescuing: a couple (Zach Gilford and Kiele Sanchez) whose car died mere minutes before the Purge began, stranding them downtown, and a mother (Carman Ejogo) and daughter (Zoe Soul) who were forced to evacuate their home after it was invaded by killers. It’s surprising for a movie like this that all five of these characters feel like real people, as you would normally expect things to go down Resident Evil-style with everyone being a cardboard cut-out ready for a gory death. The only character in the film that really doesn’t work is Carmelo (Michael K. Williams), an underground rebel fighting against the Purge leaders. His character is so laughably bad and cliché that each appearance was followed by an audible, involuntary sigh from my mouth. The main problem with the first Purge film was that the execution of an interesting story led to disappointment. DeMonaco does much better this time around, but he still tries to explore too many aspects of the Purge’s real-world implications. Instead of developing some of the more interesting ideas, he throws a million things at the wall and lets the audience member decide what to take away. There are ideas about income inequality, the moral decay of society, the untrustworthiness of the government, gun crimes, etc. The film does make a few of these things stick and offers some interesting ideas, though. Although it has its flaws, “The Purge: Anarchy” does what a lot of great science fiction aims for: take something that seems completely foreign and fictional to us and somehow use that to open a dialogue on issues that we face in the real world. Apes and humans find themselves simply trying to survive in a world where a plague has wiped out the vast majority of mankind. Riding horseback, speaking broken English and learning to read/write, the apes have begun to grow into their reputation in the original franchise. Meanwhile the humans are living in the ruins of San Francisco and losing more resources by the day. The leaders of this colony, Dreyfus (Gary Oldman) and Malcolm (Jason Clarke), discover they might be able to save the colony by restoring power to a nearby dam. Unfortunately for them, the dam happens to be located in the ape territory run by Caesar. While the plot is very simple, what makes the story interesting is the development of these two colonies and their interactions with one another. The apes are mesmerizing, of course, due to the motion capture technology utilized in the film. Andy Serkis does amazing work as Caesar, but the whole cast of stunt actors playing the apes bring a new level of life to the process. Given that the apes are not speaking full English all of the time, the personality quirks of their movement does a lot more for the audience than rubber suits or basic CGI. With Matt Reeves (“Cloverfield”) taking over for Rupert Wyatt in the director’s chair, it seemed like there were a lot of new possibilities for the camerawork in this film. Though he mostly plays it safe, there were a handful of really cool shots. The most popular of these is a sequence where the camera is attached to the top of a rotating tank, allowing for the viewer to get the full view of an ongoing battle. Another nice shot involves a long take where the camera is following Clarke around during the aftermath of the film’s big human/ape battle. “Dawn of the Planet of the Apes” has some remarkable visual effects between the apes and the night battle scene, but something that really helped the film were the characterizations of its villains. With these species colliding in a post-apocalyptic setting, black and white bad guys aren’t nearly as interesting as bad guys who you can identify with. Of course, people in the film make wrong or right decisions that push them closer to hero or villain, but we can at least understand their reasoning and perhaps even sympathize with them. 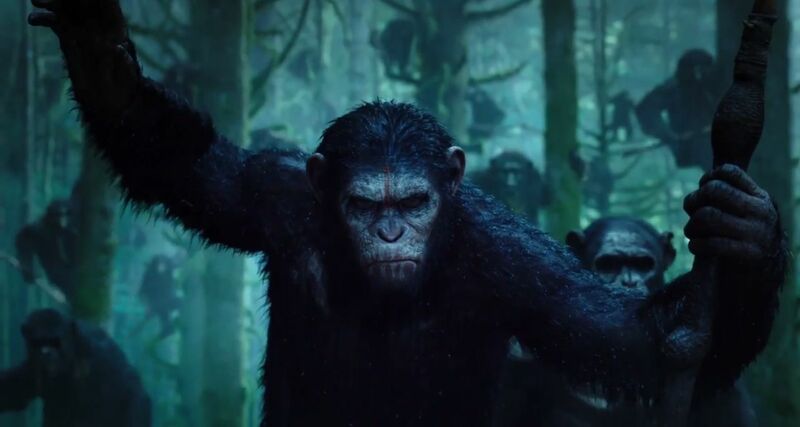 A mild improvement on its predecessor, “Dawn of the Planet of the Apes” is a quality summer blockbuster that provides more than just pretty lights and booming explosions.